Today’s dog is a domesticated version of its ancestor, the gray wolf, and he or she is motivated to seek out its kind and hone the social skills necessary to coexist and contribute to the success of its species. Although there is no need for your dog to hunt to survive, it still has the restlessness that comes with the genetic history of thousands of years of roaming the forest in search of food. Restlessness, born of the hunting instinct, is satisfied by barking, chasing, dodging, and wrestling. Often, this restlessness can manifest itself in the destruction of your home or yard. Our dog daycare program is here to change that behavior by providing restless dogs with room to express their energy and natural instincts in a safe and nurturing environment. 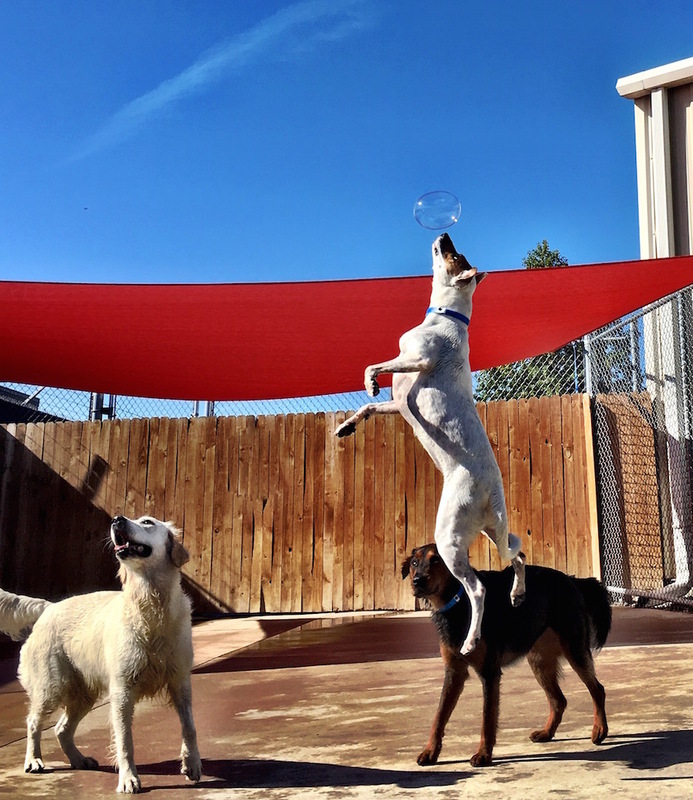 Dog daycare at Taming the Wild provides your dog with the ability to hone vital social skills to adapt to an ever-changing pack structure. This will equip your dog with the capacity to engage unfamiliar dogs in a variety of settings, including dog parks, the homes of friends and family, and veterinary clinics. Daycare is conducted in more than 12,000 square feet, the largest indoor and outdoor play areas in Memphis, under the close supervision of our staff who each participate in extensive training with owners Kira and Bryan. Would you like to incorporate obedience training and daycare into your dog's routine? Learn more about our day-training program. Do yourself and your dog a favor by allowing he or she to be a wolf from time to time at Taming the Wild's daycare. Our staff is highly trained and ready to handle any situation that arises. Daycare will provide your dog with the exercise and socialization he or she needs. Eliminate bad behavior from boredom. We have huge play areas. Our facility is clean and safe. Ready for your dog to join the fun? Take the first step by filling out our group play application! A tired dog is a happy dog. Get rid of destructive behaviors and excess energy by sending your pup to daycare. Most dogs don’t get nearly enough exercise. Imagine if you were confined to a crate all day while your owners were at work. Of course you will have a lot of energy and want to play all night when they get home. By sending your dog to daycare, they will be fully exercised and worn out by the time they get home. This means more cuddles and less dog “zoomies”. 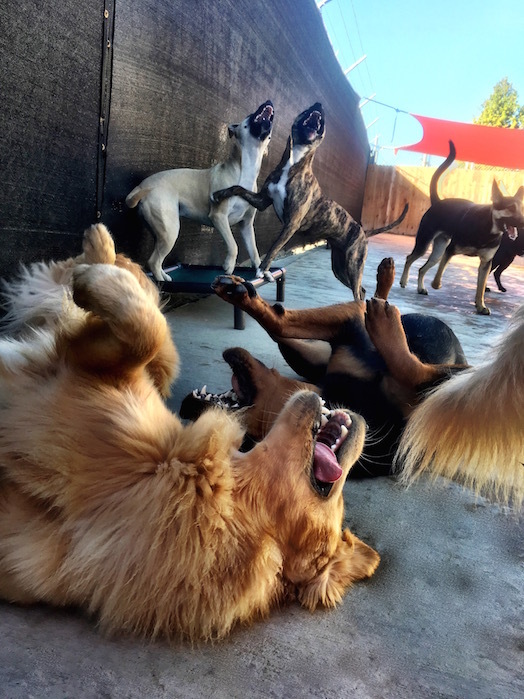 Play areas and dogs are segregated by many factors that include the number of dogs, size, temperament, gender, age, physical disabilities, etc., to ensure a safe, productive, and stress free experience for all dogs. TTW has two large outdoor play areas and one indoor play area. Outside play is weather dependent. Even though we offer plenty of shade, fresh water, and a kiddie pool, the ambient air temperature and storm conditions must always be taken into consideration for safety. If outside play is unavailable due to weather concerns, indoor play is activated. During mild to moderate weather days, most dogs will enjoy at least 4-8 hours of play. Dogs are eligible to attend daycare when they are four months old. They must be current on their Rabies, Bordetella, Distemper, and Canine Influenza (H3N2/H3N8) vaccinations. It is not necessary for your dog to be spayed or neutered before coming to daycare. We recommend that you feed your dog at least an hour and a half before coming in to play. As of July 2017, a special handling fee of $8 per day will apply to "NO PLAY" dogs utilizing daycare services. Our facility is open 7am-7pm Monday through Friday. Saturday and Sunday, we are open 8-10am and 4-6pm. You can drop off and pick up your dog anytime that we are open. Please make sure that your dog is on a leash at all times when picking up or dropping off.